Once all the research has been completed, conclusions drawn, and papers written, there's just one thing left to do: the poster presentation. Our students have been busy sharing their findings, with pride, in venues ranging from Benedictine Commons to the nation's capital. Here are just a few highlights. 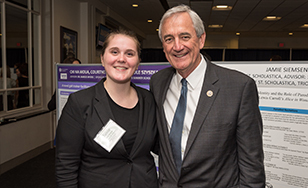 In April, McNair Scholar Jamie Siemsen became the College's third consecutive student presenting at the annual Posters on the Hill national research symposium in Washington, D.C. hosted by the Council for Undergraduate Research. Siemsen's project was "Lockean Identity and the Role of Parodied Recitations in Lewis Carroll's Alice in Wonderland." Through a highly creative interdisciplinary analysis, she skillfully applied 17th-century English philosopher John Locke's philosophy of personal identity to "Alice in Wonderland." She was one of just 60 students selected from more than 300 applications. In February, four Saints showcased their work at the Minnesota Private College Council's Scholars at the Capitol event in St. Paul. Lisa Ito, Paul Schulzetenberg and Kathleen Reicher conducted chemistry research on possible anticancer/antibiotic agents, and Sun Ny Vang studied Kwv Txhiaj, the Hmong tradition of intertwined music and speech. The event provided the opportunity to explain their research projects and network with peers and faculty from other colleges. Shortly before this year's spring commencement ceremony, the College hosted a Graduate Research Symposium and honored four students for their outstanding scholarship and citizenship. just completed her Doctor of Nursing Practice. She developed, implemented, and evaluated a quality improvement initiative focused on reducing the number of pressure ulcers at a long-term care facility, which ultimately improved the outcomes and quality of life of numerous patients. Occupational Therapy student Shelly Bruecken received the Living our Mission Award for her commitment to the Benedictine values. As part of her goal of building community with others and providing hospitality to people who are experiencing homelessness, she is a live-in member of the Duluth Loaves and Fishes Community's Olive Branch house. She assists in neighborhood event planning, home repair and improvement, daily kitchen work, and planning for community discussions and speakers. Allegra Birdseye, a student in the Graduate Teacher Licensure (GTL) Program, received the Pre-Capstone Award, a final research project that is reflective of the College's Benedictine values. Her proposed project, "Learning the way: A replica study of supports for learners with refugee backgrounds," aims to determine what practices are in place to engage and support learners with refugee backgrounds in Minnesota secondary classrooms. Jillian Tomsche is also a GTL student, and received the Post-Capstone Award for completing an outstanding capstone or research project that is reflective of the integration of the College's Benedictine values. "Culturally Responsive Teaching: Students' Perspectives of Relationships," evaluated the relationships in school settings from students' perspectives. As the academic year came to a close, graduate and undergraduate students showcased their poster presentations as part of Scholarly and Creative Arts Week. Students from all disciplines presented the research and projects they have been working on this academic year, in a poster session in the Benedictine Commons. Jamie Siemsen was announced as the winner of the Bede Research Award highlighting outstanding undergraduate research. Jacqueline Johnson, professor of Sociology and former Chancellor of University of Minnesota Morris, discussed the topic of "Sustainability and the Liberal Arts." The College hosted the 15th annual Twin Ports Undergraduate Psychology Conference, featuring students from St. Scholastica, the University of Minnesota-Duluth, and the University of Wisconsin-Superior presenting papers and posters on topics from all areas of psychology. The College's Physical Therapy, Occupational Therapy and Athletic Training students presented their original research and critical reviews on a variety of topics relevant to all practice settings during a poster presentation in the Benedictine Commons on campus.